Brian Allen and Mike Gutgsell have managed to keep The Lamp Repair Shop in South Portland open for three decades. Repairs pay the bills, but it's their inventions that fuels their creative side. 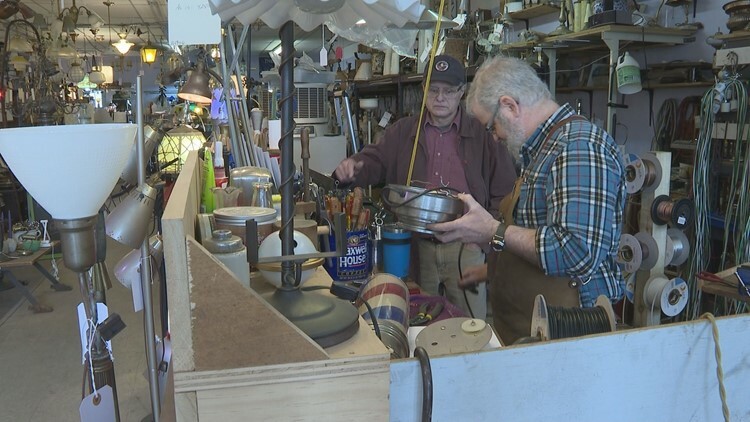 Brian Allen and Mike Gutgsell have managed to keep The Lamp Repair Shop in South Portland open for more than three decades. Repairs pay the bills, but it's their inventions that fuel a creative side. SOUTH PORTLAND, Maine — The Lamp Repair Shop in South Portland is both unique and quirky. It makes for the perfect setting of a 207 story. Brian Allen opened the business out of his home in 1986. He moved to the Knightville area of South Portland in 1999 and has stayed there ever since -- outlasting other lamp repair businesses in southern Maine. "Everybody has a different problem with a different kind of lamp, and sometimes you have to think right on the spot and come up with a repair for people," said Allen. The same year that Allen moved the business to Knightville is when he took on his business partner, Mike Gutgsell. Gutgsell is in charge of The Polishing Shop at the business, making old things look new again for the last 20 years. "I would say the instant gratification of taking something that is really tarnished or corroded and bringing it back to its natural beauty," said Gutgsell. The duo have a busy repair and polish schedule, but when you look around, you'll notice the creations more than the fixer uppers.They enjoy making lamps and light fixtures from non-conventional parts. "The repairs are the bread and butter, and that will keep me here," said Allen. "That will pay the rent and pay the bills. The creations will satisfy the urge to build something." From oxygen tanks made into rockets to metal fire places, there are creative inventions that shine and, most importantly, that work. The Lamp Repair Shop is open for business Monday through Friday from 8 a.m. to 4:30 pm.